Pappus (or Pappos) of Alexandria (Πάππος ο Αλεξανδρεύς) (about 290-350) AD is the author of Μαθηματική Συναγωγή, or shortly Συναγωγή (Synagoge) (Mathematical Collections), which contained as the name suggests a collection of all the Mathematics known until Pappus' time. Very little is known about his life and the only date that is very accurate is the solar eclipse which he observed on 18th October 320 AD. Commandinus provided the first translation into Latin 1589. Others like Wallis followed until 1878 when Friedrich Hultsch provided a complete translation. 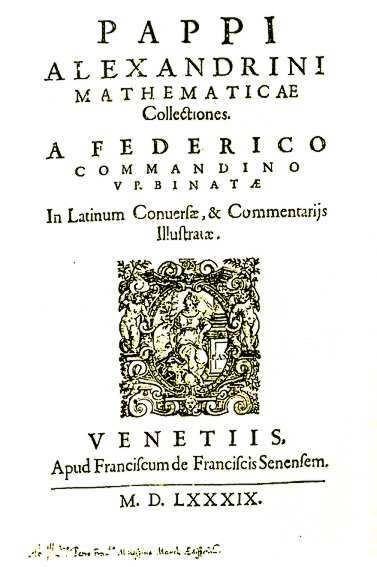 The Mathematical Collections of Pappus in a translation of Federico Commandino (1589). Although there is little originality, Pappus showed great understanding in all topics. Book I and II covered Arithmetics . Both books excepts parts of II are lost. Book II considered very large numbers. 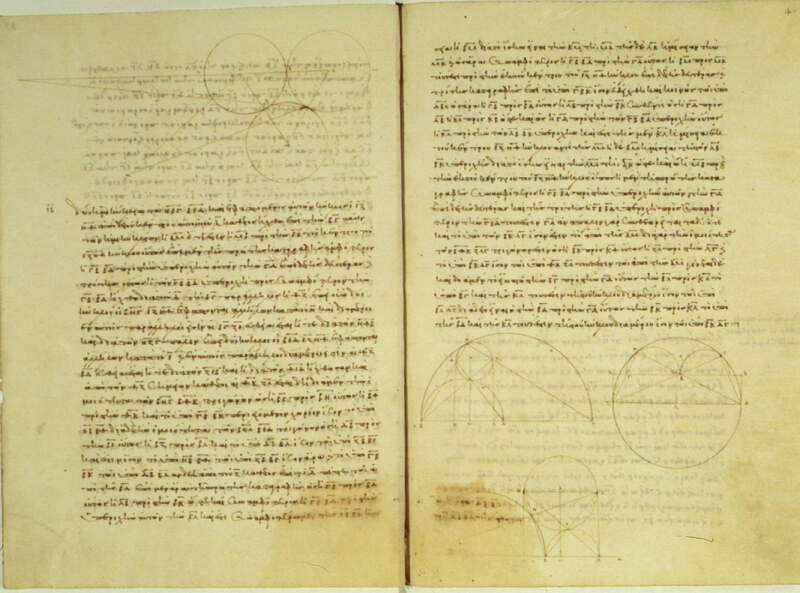 Book IV treated curves such as spirals and the quadratrix (two construction methods described: using a cylindrical helix, and using a right cylinder the base of which is an Archimedian spiral). Now, analysis is the path from what one is seeking, as if it were established, by way of its consequences, to something that is established by synthesis. That is to say, in analysis we assume what is sought as if it has been achieved, and look for the thing from which it follows, and again what comes before that, until by regressing in this way we come upon some one of the things that are already known, or that occupy the rank of a first principle. We call this kind of method “analysis” as if to say anapalin lysis (reduction backward). In synthesis, by reversal we assume what was obtained last in the analysis to have been achieved already, and, setting now in natural order, as precedents, what before were following, and fitting them to each other, we attain the end of the construction of what was sought. This is what we call “synthesis. 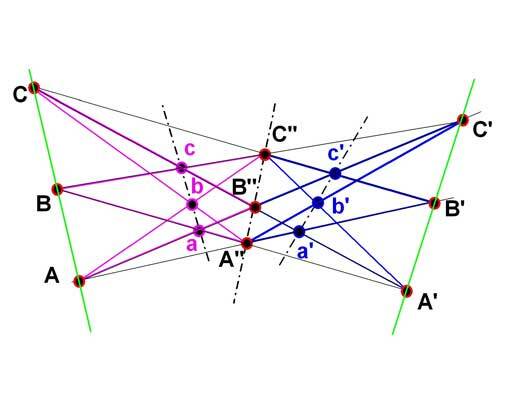 'Pappus Problem' (now known as Pappus' Hexagon Theorem). 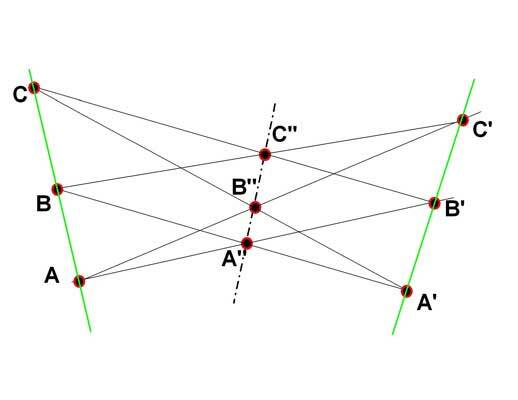 If ABC and A'B'C' are straigth lines; and A'', B'', C'' are the intersections of AB' with A'B, AC' with A'C, BC' with B'C respectively: then A''B''C'' is a straight line. Marcel Berger, Das Unendliche in der Geometrie (The Infinite in Geometry), Spektrum Spezial: Das Unendliche, p. 38, ND 1/2003. Pappus' Area Theorem A generalization of the Pythagoras Theorem (extended Theorem). Take a triangle ABC, generate on the two sides two parallelograms DEAB and AFGC. Extend ED and FG. They intersect at the point P.
From Vignettes of Ancient Mathematics by Henry Mendell, Cal. State U., L.A.